Li told the Global Times that this allows him to find out what is going on in local communities without having to browse the internet on his smartphone. 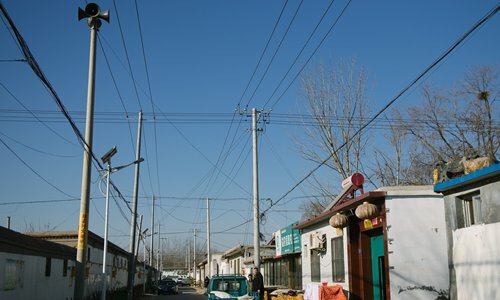 The four loudspeakers on wire poles installed in the village spread messages over a certain area, evoking nostalgic memories among rural residents in China, as loudspeakers were a common sight in villages decades ago. Some locals still remember those days in the 1970s and 1980s when loudspeakers spread important announcements or told villagers to gather for community meetings. And now they are coming back to convey a new message. Xu Yinsheng, who is in charge of the radio station's control room in the village, stands in front of a console and a microphone, checking to see if the equipment is functioning properly. This room is the center of the so-called New Village Loudspeaker Project, a Party-led campaign that has so far covered 3,760 villages with 4,200 radio stations in Shijiazhuang, capital city of the province. The project was first launched in Zhengding, a county in southwest Hebei, in December 2016. A group of producers and anchors at local radio and television stations in Shijiazhuang record programs every morning, which are later distributed to each village in the region and played three times a day, Gao Wei, program director of the station, told the Global Times. Those born in the 1950s and 1960s in Chinese villages are familiar with the presence of loudspeakers, as they played a key role in community life when there were no other entertainment activities. 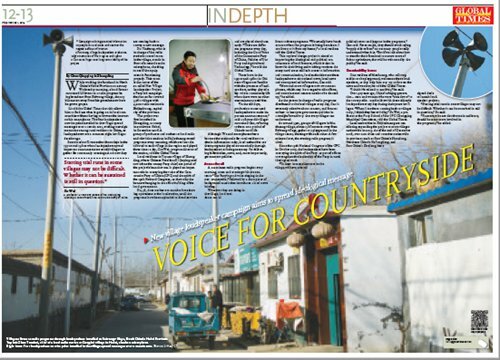 "In the old days, production teams used loudspeakers to make important announcements," said a 78-year-old villager surnamed Gao, referring to them as a symbol of China's rural life. Although TVs and smartphones have become the main tools for rural residents to obtain information today, local authorities see these programs played automatically through loudspeakers as being necessary for delivering information, news, and, more importantly, government policies. A 20-minute radio program begins every morning, noon and evening with the sentence "The Party's good voice singing in the new countryside," followed by a short piece of background music that introduces a local news briefing. Whatever they are doing in the village, local residents can all listen to these programs. "We usually have lunch at noon when the program is being broadcast. I can listen to it from my home," a local resident told the Global Times. This top-level design project is aimed at improving the ideological and political consciousness of local farmers, which is also in line with their living and working routines. 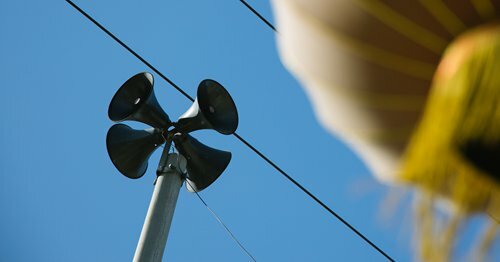 As many rural areas still lack access to information and communication, local authorities use these loudspeakers to air national news, local news and some practical information, Gao said. "More and more villagers now own smartphones, which may have negative side effects, and some internet content needs to be cleaned up," he added. As the person in charge of radio programs distributed to the local villages every day, Gao is extremely selective about content, and focuses on how to interpret government policies in a straightforward way that every villager can understand. At around 5pm, groups of villagers in Muzhuang village, about 15 kilometers away from Beiwang village, gather at a playground in the village center, chatting with each other. A few minutes later, the evening radio program is aired. Since the 19th National Congress of the CPC in October 2017, the loudspeakers have been conveying the spirit of the Party as part of efforts to strengthen the leadership of the Party in rural ideological work. "To draw in more listeners in the village, we have to avoid political terms and jargons in the programs," Gao said. For example, they should avoid saying "supply-side reform" as not many people really understand what it is. "But if we talk about how to transfer their farmland to ensure more efficient agriculture, that will be welcomed by the public," he said. One resident of Muzhuang, who sells vegetables at the playground, welcomes these loudspeakers, as they help him stay up to date on the news and weather, he told the Global Times. "I think it's related to our lives," he said. Over 40 years ago, China's zhiqing generation - men and women who were "sent down" to the countryside - used to live with these old-style loudspeakers every day during their years in villages. "When I see them coming back to villages today, I think they have vitality," Su Wei, a professor at the Party School of the CPC Chongqing Municipal Committee, told the Global Times. Local authorities in Shijiazhuang are considering expanding the project to more villages nationwide in 2019. As of the end of December 2018, over 200 cities and counties nationwide in provinces such as East China's Shandong, Northeast China's Heilongjiang, and East China's Zhejiang, have signed deals to launch loudspeaker projects. 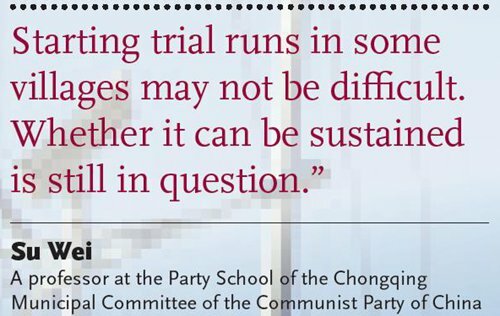 "Starting trial runs in some villages may not be difficult. Whether it can be sustained is still in question," Su said. "Farmers, who are also the main audience, should become more involved in the programs," he added.